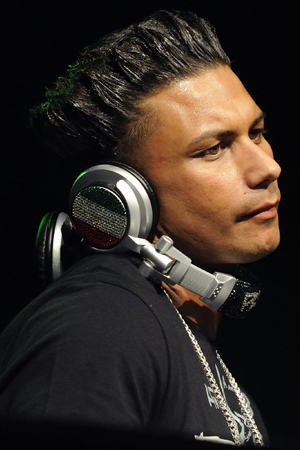 It’s no secret that Pauly D knows how to throw a party. The DJ is already imagining the type of baby shower he’d throw for his expecting Jersey Shore castmate — complete with pickles, of course! The cast of Jersey Shore has made their fame by having a good time in quite unique ways. That’s why it’s no surprise that Nicole “Snooki” Polizzi asked fellow castmate Pauly D to join her and fiance Jionni LaValle in the delivery room to spin a signature Shore soundtrack while giving birth! The DJ won’t necessarily be planning her baby shower, but he did imagine what it would be like if he actually were in charge of putting together that party. “I would have spray tan booths in the corner, because she loves to tan, and a lot of loud music,” he said. Pauly D also brainstormed a few styling techniques that he’s ready to share with Snooki’s child — once old enough, of course.